The truth is that most girls hate packing, so they grab bags/boxes and start throwing in anything they can lay their hands on without much thought. That's why it looks like they packed everything they have as though they'll go out of fashion before they get back. Whew! 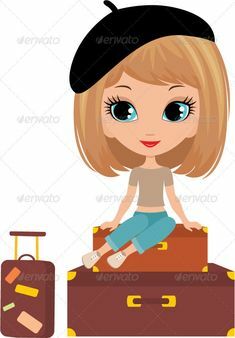 So girls, if you're going on a trip, short or long, here's how to be a homing pigeon as far as packing is concerned. Packing can actually be fun. 1) Over-night trip. Sometimes you may plan to make a short domestic round trip in a day - say Lagos/Abuja - but get to stay overnight due to unforeseen circumstances. For such a scenario I recommend wearing a top and bottom then packing an extra top (or shirt if it's a business trip), a toothbrush, deodorant, a change of underwear, a small towel and all the regular stuff you normally have in your handbag like your makeup bag, hairbrush and tissue. If you stay with a friend or family or in a good hotel, things like soap, tissue, toothpaste, body cream(except you're really particular about your cream, then you can take your own supply in a small bottle) combs/brushes, hair dryer, towels etc won't be a problem. At worst, you can easily buy them. All you need for this trip is a medium/big handbag. 2) Weekend trip. This kind of trip is usually for events like weddings. So, let's assume you are attending 2 events on that trip - the wedding and the after-wedding party. You'll need your big handbag and a small travel bag/box. Start with the full outfit for the wedding itself. Then co-ordinate what you'll wear to the party to go with the same shoes, bag and jewelry that you'll use for the wedding. It's the same day and you're not in competition with anybody, to show-off how many bags and shoes you have. (You can show-off all you want when the event is where you're based.) Also, pack everything recommended for the over-night trip as well as things like soap, toothpaste, combs, a small towel etc. My limited experience with travelling for weddings is ; it's usually a mad house because of all the other incoming guests and, you really don't want to share the basic utilities the host/hostess or hotel provides, plus they are never enough to go round anyway. You're better off having your own supply. 3) 1-3 weeks trip. This could be a domestic or international trip. Let's assume you're taking some time off and going on vacation. The clothing you pack will depend on where you're going and what you'll be doing. Don't carry work-out clothes if you know you won't work-out! Don't take evening dresses if you're going mountain climbing - Duh! Unless you're going to slimming camp and planning to cheat, you don't have to pack food. If you're planning to shop while on the trip, the less you should pack. You can always wear the new things you'll buy and you should make space for those new things. That said, it's easier to go with tops and bottoms that you can mix and match (tops to bottoms ratio can be 3:1), instead of dresses that you have to wear a different one each day. Make laundry arrangements so you can repeat some items of clothing. Then of course, co-ordinate all your dressy outfits to go with one pair of dress shoes, bag plus accessories and do same for all casual wear. Include one swim-wear(if you plan to go swimming or visit a beach). Your handbag and one medium travel bag/box will serve. 4) 1-2 months trip. Again, this could be a domestic or international trip. Let's assume you're going on a long summer vacation outside the Country. Pack everything recommended for the 1-3 weeks trip then include an extra pair of dressy shoes and bag along with another pair of causal shoes and bag with accessories to match. Add a few more tops and one or two bottoms depending on how much space you have - don't forget to co-ordinate the clothes to go with the shoes, bags and accessories you already picked out. Include one or two swim-wears(if you plan to go swimming or visit a beach), 2 sets of work-out clothes, a pair of work-out shoes(if you plan to work-out) and a few dresses. Also, if you're planning to shop while on the trip, the less you should pack. One large or two medium travel bags/boxes should serve. 5) 3-6 months trip or more. Another domestic or international trip. Let's say you're being transferred temporarily. Take the best of everything you have. They truly may go out of fashion by the time you get back(LOL!) that's if dust and rats don't get to them first. Two large bags/boxes and a smaller hand luggage should serve (or whatever your airline allows). Along with everything recommended for 1-2months, take all the really nice things that you can't do without. I recommend sorting everything into 3 piles - 'definitely', 'maybe' and 'definitely not'. Pack the 'definitely pile' first then start adding the ones from the 'maybe' pile until you run out of space. You can replace all the others when you get where you're going or if/when you come back. Bonus - make use of every space. Anything hollow, shouldn't be left empty. Stuff socks and small bottles into shoes and bags before packing them. Doing this also helps maintain the structure of the bags and shoes. Also, remember to pack based on the weather of your destination. You're welcome! There you go. This is only a guide on what to pack and what not. Overall, basic instinct, common sense and proper planning should help you decide what to take and what to leave behind. Have fun on your trip and don't forget to drink lots of water! Hehehehe I suggest you make a list of all the things you intend to pack before you start. Then check off the items on the list as you pack. Hmmm I'm guilty in this one. I pack like there's no coming back just incase something else comes up. I gotta take my hair straightener, soap, toner etc. It's not easy oh. However, ild try to curb my excessive packing. .. Your blog rocks!! New here and im loving all your tips!! Oya ladies jump in here and read o, this is so informative and useful. All that over packing for a short trip with things you will never use. Some guys a guilty too. Lovely blog. Thanks! Seems you're a first hand witness of the over-packing eh? And there I thought I didn't know how to pack! But according to these rules I totally rock. Got it to a tee right down to "definitely, maybe and definitely not". Yay me!! !